When I saw this recipe come up in my reader board last week, I knew this was exactly what I would be making for dinner. 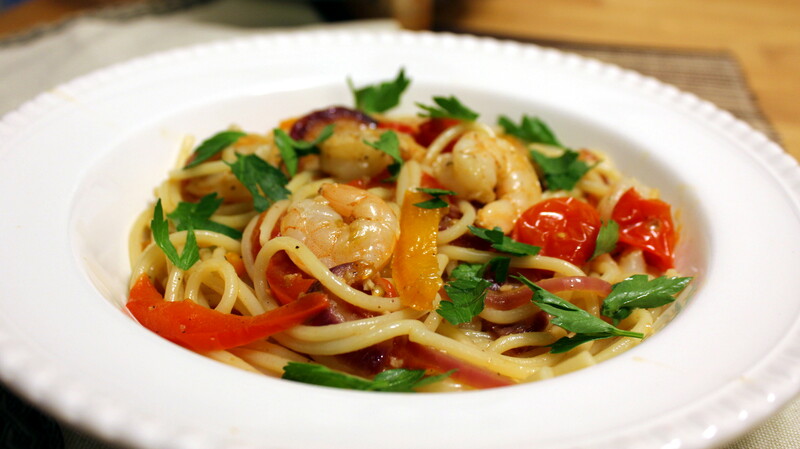 Thank you so much Marisa for the inspiration and a new favorite shrimp and pasta dish! We’ve been on a huge shrimp kick lately in this house, largely because we’ve scored some great deals on shrimp lately and also because the teenage daughter does not like shrimp and has been nearly non-existent for dinners at home as of late. That’s bonus for hubs and I because that means shrimp for dinner! We already had most everything on hand already so all I had to do was buy a yellow pepper to pretty it up and a fifth of brandy. Don’t skip the wine and brandy if you can tolerate alcohol, as both add such a unique flavor to the dish! Otherwise you can sub a little chicken broth and maybe a splash of vinegar for some zing. This will be a meal I plan on making often, and once you try it I think you’d agree! This serves two, so double or triple if feeding more. Set a pot of water for the spaghetti to boil on the stove. 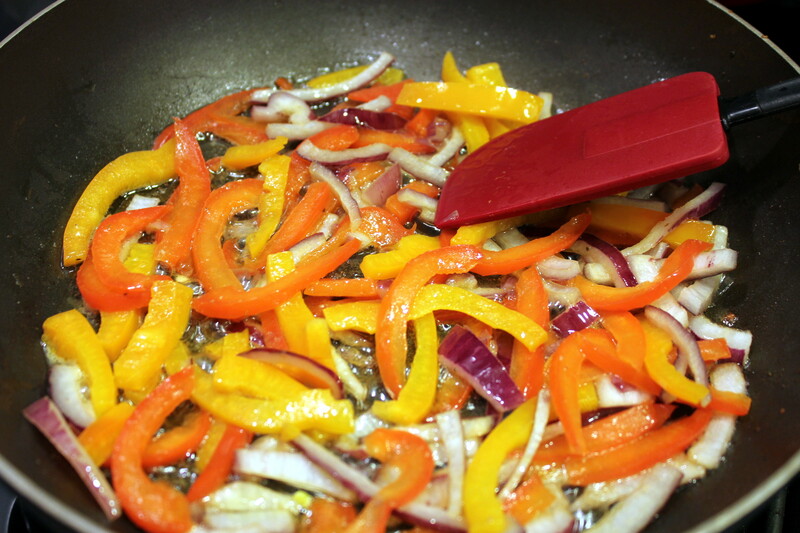 Meanwhile, heat the olive oil in the same large skillet and cook the red onion and peppers for about 5 minutes. 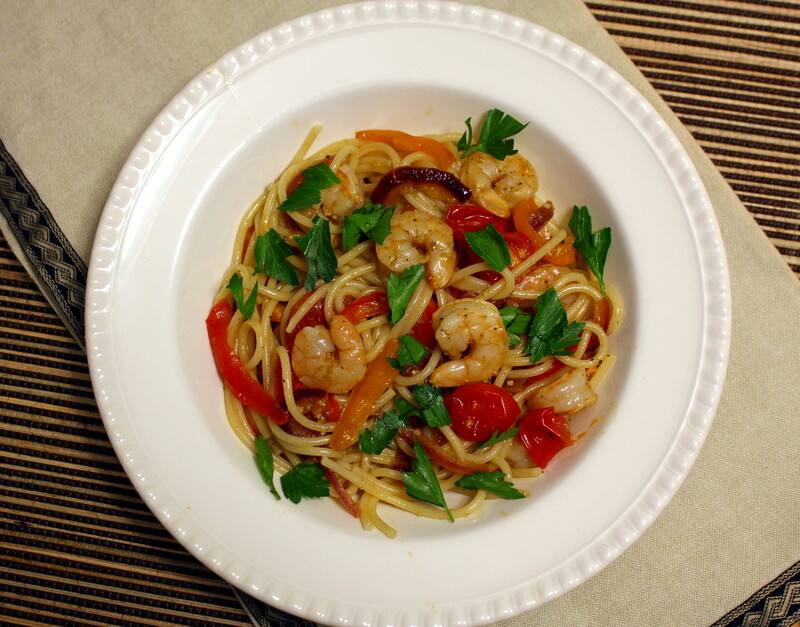 Stir in the garlic, tomatoes, basil, red pepper flakes and additional seasonings, to taste. Cook for several more minutes, then add in the white wine, brandy and the butter. Stir to combine, then let simmer for about 10 minutes. Add the reserved shrimp in the last few minutes of simmering time. Oh yum! Colorful, easy, tasty — I’m all in for this one, Kathryn. Have a superb Saturday. Mega hugs! This dish looks delicious. Similarly to you, I greatly broadened what I cooked after my children grew up. My husband and I enjoy many foods now that I seldom made when our kids lived at home because one or more of them didn’t like it. Just downloaded this and will try it this week! 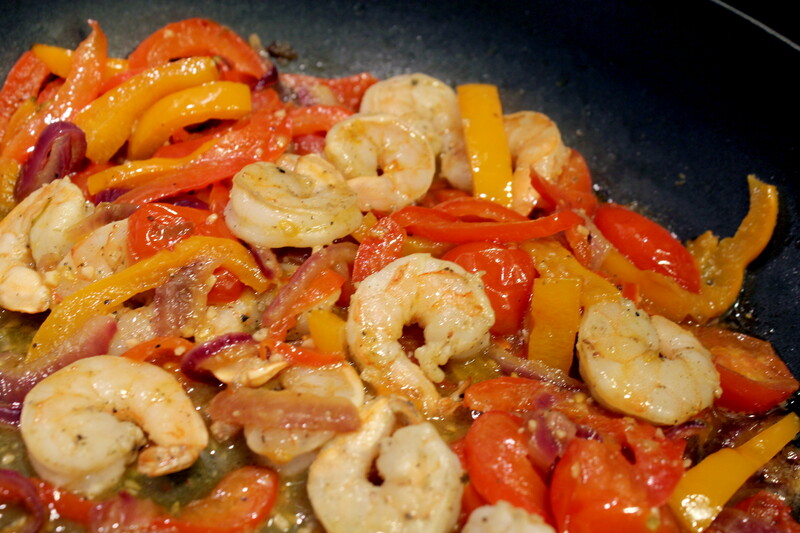 My daughter and son in law are living with us right now and they LOVE shrimp and peppers! Yum is right, thanks Sam! Wow, Kathryn does this sound incredibly delicious. I have been wanting shrimp a lot lately, scallops too for some reason. Love that they are swimming in booze and nestled into some gorgeous pasta and veggies. Yummy!! Looks like a good company dish. Yes, I do think it would be. Thank you Bernadette! Yes indeed! Thanks so much Ronit! Thank you Diana! Sure wish my tomatoes would grow quicker. It’s supposed to freeze (again) tonight, augh! Time to pull out the plastic sheet again. Oh no. We haven’t had a frost since early May. No tomatos yet, though. I bet this recipe would be delish with sun-dried tomatos too! Oooh that sounds like a good idea! That looks great! My whole family loves shrimp so this would be a good one! Thanks so much, I hope you get to make it for them! That looks so good. I will be trying it! yumm KR! this looks so good! This looks delicious! And the colors are gorgeous! I’m so conservative when it comes to making pasta.. Should really try this! Great job! Wow what a great compliment, thanks for stopping by and saying so! Would love to try this…great share!!! Yum..sounds fusion as in asia we have drunken prawns! Thanks for the share! You are most welcome and thanks for stopping by! Wow Kathryn this dish is so beautiful!! 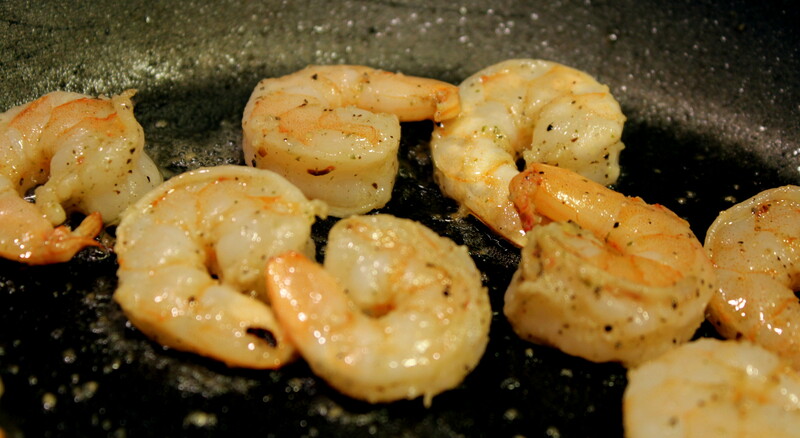 We love shrimp here too and they perfect for summer time when you don’t feel like cooking for hours in the Texas heat. Hey Mel, so good to ‘see’ you and thank you! Everything is peachy keen here. Daughter is traveling to Austin to visit my family and tour UT campus again on Tuesday. She’s so excited to show her boyfriend that and other touristy stuff, lol. Oh how fun!! Got to LOVE Austin 🙂 Will she be attending UT this fall? Oh wow how exciting 🙂 UT is a great school!! I had no idea that you had a degree in Journalism from UT!!! That’s not old that’s cool!! I am not a big shrimp eater but this looks amazing! I am so happy to be back blogging. Yum! I like the vinegar and chicken soup substitution for brandy. I like my shrimps drunk! The presentation is great! I would suggest trying it without the parm. cheese. My Italian friends always chastise me when I try to add parmesan to seafood pastas. I’m not sure why, they just do! Yes, I have heard that about Italians. I don’t know why either, it tastes great with it I think! My kind of pasta. Simple yet full of flavor! Looks so colorful and delicious! Thanks Tonya! It’s a keeper in this house! Yep, chicken would be a great substitute, thank you!